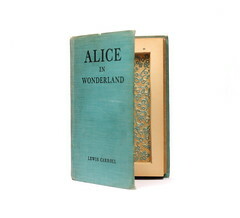 This blue vintage copy of Alice in Wonderland by Lewis Carroll has been transformed into a hollow book box – a superior stash spot for things important enough to keep tucked away. If I could keep it myself, I would, but it’s my job to pass all of these awesome things on. 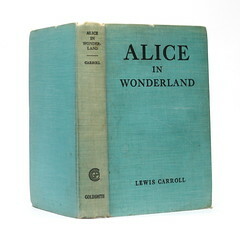 I dearly love Alice in Wonderland. Did you know that it’s available to read for free online? 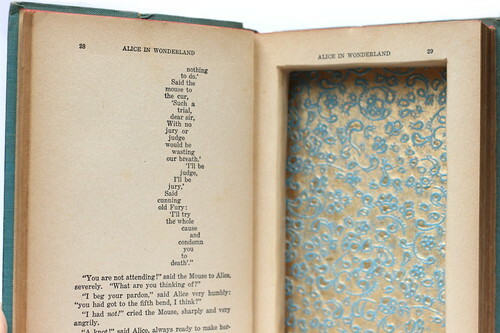 This time around I added textured, decorative paper to the bottom of the stash spot that really accents the vintage blue cover of the book. It’s really been around, but hopefully soon it will find a new home with someone who will enjoy it as a box for a long time. View the listing for this in my Etsy shop.